Hey Hey Hey!!! Are you all almost ready for Christmas?? It's only 10 days away!! Where has the time gone!!! I am so running out of time to get all the things done I want to!! But I just keep pluggin away and hopefully I will manage it all! Today I have a brand new release digital stamp to show you for Faery Ink!! Aja is just plain awesome if I do say so myself!! I loved the challenge of a darker skin tone which I don't do very often.. and coloring her dreads was so much fun!! I adore the snowflakes in the background it just gave it such a wintery feel!! Isn't she just lovely!!! I loved coloring her soooo much!!! To create the Diagonal Double Gate Fold I used this tutorial and loved doing it!! It is such a fun card!! 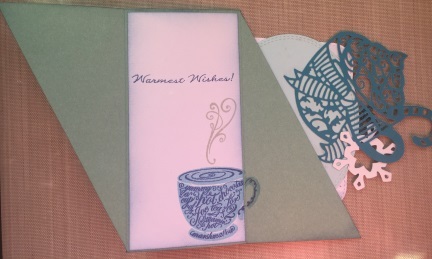 This simple twist give such an interesting detail to the card!!! 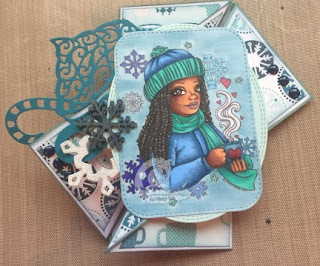 I used different dies for all the cuts you see like the coffee up and snowflakes, even the image and mat. The pattern paper is from the Echo Park Hello Winter paper pack and I must have more of it!! So much more!!! LOL I used CTMH Twilight, Crystal Blue, and Saphire cardstocks. The blue enamel dots are also from CTMH and I used Tim Holtz Faded Denim distress ink to edge all the peices. 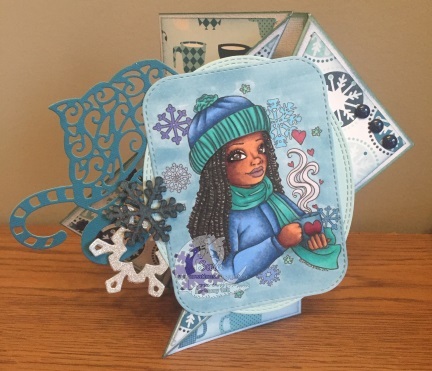 The inside I stamped with CTMH Crystal Blue and Twilight inks using CTMH Wonderland and Very Merry Christmas stamps. And as you can see I should have followed the tutorial better and stamped that coffee cup prior to glueing down the white cardstock... but we live and learn right!!! Thanks for popping in today! I always have so much fun showing off my new creations with you all!!! 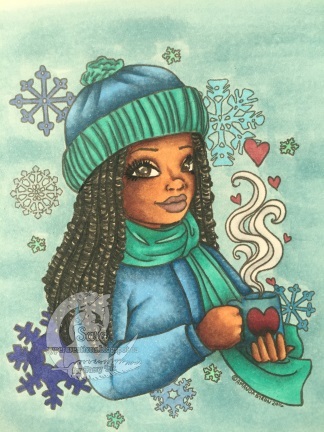 Make sure you pop by the Store today to pick up your very own Aja- Warm drink, cold day digi stamp! !